The dress I chose to style up was my fruit-patterned 1980s vintage dress that I bought on eBay a year or two ago – yet to be seen on the blog! To read some tips on buying vintage on eBay, read this recent post – the great thing about wearing vintage to a wedding is that you are guaranteed there won’t be someone else there in the same dress. The wrapover style of this dress is cut far too low to wear alone, so I added a bright pink vest top and picked out the colours in the pattern with bright tangerine heels and a purple belt. 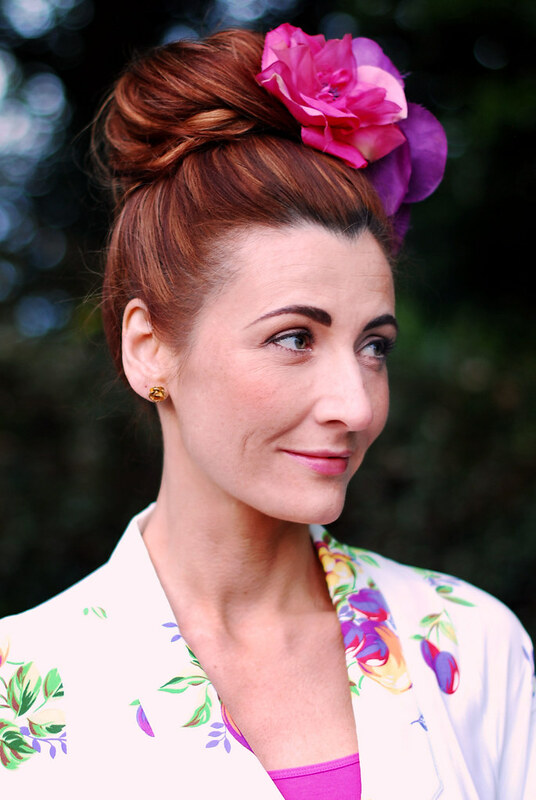 Instead of a hat I went for a huge up-do (created with a hair donut you can buy here) and added two silk flower corsages – a different take on a fascinator which can cost upwards of £50 or so! My version was a lot cheaper – one is a pin and the other is a flower hair tie, so you can save a lot of money if you forgo the (not-actually-that) obligatory hat. Just as pretty and a lot more modern…! Wedding Week will continue on Wednesday with another outfit post: What To Wear To A Beach Wedding. You rarely get to go to those in the UK, but Brits do go abroad for them and I’m sure panic at the mere thought of what to wear! 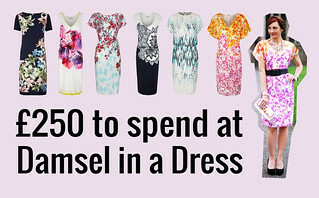 Plus don’t forget my MAHOOSIVE giveaway: £250 to spend at Damsel in a Dress. Perfect for buying a complete wedding guest outfit – click below to go to the giveaway post! Have you been to a country church wedding recently – what did you wear? Let us know in the comments! That's such a unique dress, and I love how you styled you hair as well! Ooh what don't I love about this look?! Absolutely nothing! The colors, the floral, your hair and those shoes!!! Especially love the clutch. This is just so lovely! The colors in the floral print are so pretty and OH EM GEE your hair with those flowers is prefection! This is a beautiful look for attending a wedding! An amazing outfit Catherine. What a thoughtful response on the 'wearing a white dress' question. I agree – other than the friends I shopped with for my wedding I wouldn't have a clue what most of them wore 🙂 Thanks for sharing with Wardrobe Wednesday – can't wait to read the rest of this series! Thanks Kelly – I've had another thought about the wearing of white as part of your outfit: I think as long as you couldn't be mistaken for the bride (whether that's a bride in a trouser suit, knee-length dress or full length gown) then you're okay. I don't think I look anything like "the bride" in this dress, so I'd be happy dressed like this as a guest! Spectacular, beautiful … A wonderful look. Living in traditional, catholic Bavaria, elderly ladies would still take offence if a woman was wearing a (in their eyes) too short, to tight, too bare dress to church – so this one is definitely perfect. And the longer sleeves make sense as country churches tend to be old and cold. Love your "Catherine styling" with the bright accessories! I really like the last photo of this beautiful set. The flowers in your hair is a charming touch. Love this, Catherine! So chic and appropriate! Great job! What a gorgeous dress! Perfect for a wedding! A lovely look and also some great tips. stunning dress! perfect flow and beautiful! That's a real show stopper of an outfit. You're so gifted at co-ordinating colour! I love when you wear dresses, and if you add flowers I just melt. Is it alright for you to wear a white dress to a wedding? Would that not be considered offensive, since that's the bride's dress colour? Or is it deemed ok, because your dress has a colourful print on it? I would never dream of wearing a white dress to a wedding – and I've never considered this dress to be white?! Most summer floral patterns have a white background, and the fact that the colours of the pattern are pink, green, purple, orange, red, etc. – plus I've accessorised with pink and orange – it didn't even vaguely occur to me that I was "wearing white". I've worn a dress to a wedding before that had a white top part, then the skirt was white, beige and black stripes – I wore pink shoes and had a pink bag, and I don't think anyone thought I was wearing a white dress. I've been a bride twice before, and I have to admit: I wouldn't have had a CLUE what any of the guests were wearing, let alone if anyone was wearing white – there's too much other stuff to worry about! I think it's the guests that have this notion that you "can't wear" certain things and worry about it, and a floral dress that has a white background isn't a white dress (to rival the bride's dress) to me. Most of the dresses I've picked out in my giveaway have a white background – quite typical for a summer floral! Saying that – I wore sage green the first time I got married. My mum told me recently my auntie wore a white suit to my wedding apparently, and I wouldn't have known, or cared (in the nicest way, of course)! gorgeous from head to toe! love the printed dress & that it's a midi length skirt is fantastic!!!!! and a orange wedge . . . in love x2!